Excellent, informative, well paced and perfect for anyone looking to get into Russian history! 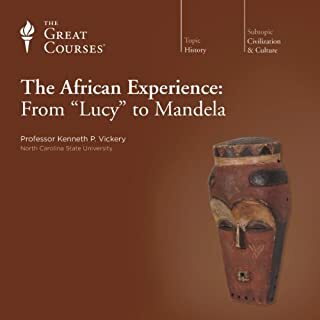 I went in knowing nothing about the country's history so this course was perfect. I am a retired man who spent good years in technology thus missing ample in history. With more time available now I wanted to catch up on that but being a slow reader, printed books wasn’t the best and the most motivating option. Thanks to audio books that filled that void very well. 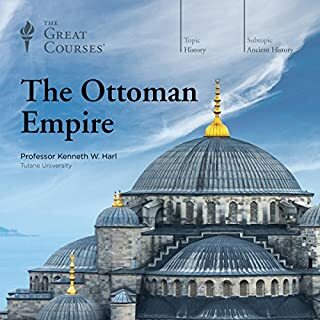 And it’s in this search for better audio books on history that I stumbled on The Great Courses. 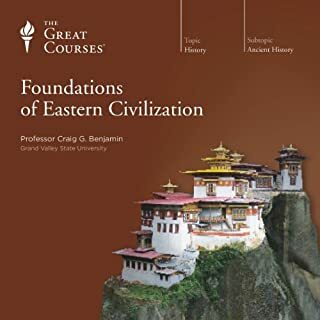 I signed up for Audible and started with this one on Russian history as a free trial. And was it worth it? To answer that question simply, “I think I am sold to it”. 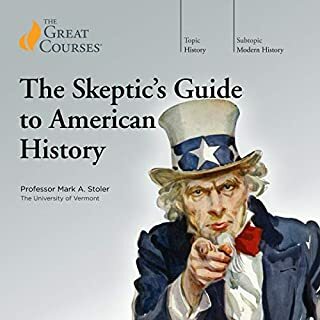 Professor Mark Steinberg does a commendable job walking one through the Russian history in a very lucid, fairly paced and absorbing delivery. I found it so riveting that I finished the entire 18-hours plus of listening in just 4 days. 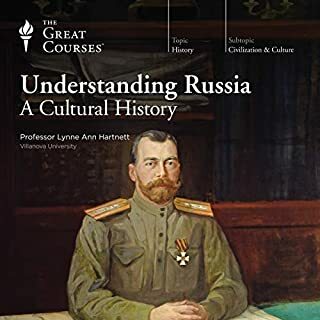 His knowledge, as I learnt late during his narration, is not just based on an academic study but also enriched by his physical knowledge (presence) of the then USSR where he studied and also taught - a fact that hadn’t been highlighted in the introduction to his lectures. 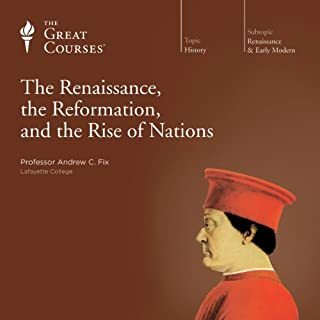 I’ll conclude saying that this lecture series on Russia alone is worth the subscription of a whole one year at Audible. 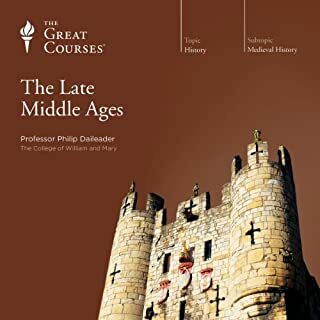 I am a history lover and this was an enjoyable listen. 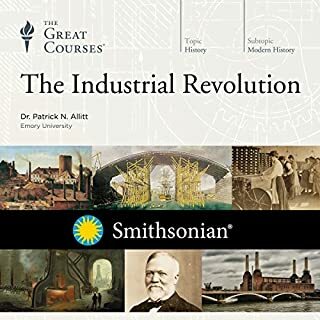 The professor is very knowledgeable and does an excellent job and highlighting and explaining the various climates, movements, and major events in modern Russian history. He is especially good at covering the social history of Russia with a focus on the common man and the intellectual movements in Russian history. A few words of caution however. This is only a history of modern Russia in that it only goes from Peter the Great to the near present, not ancient or medieval Russian history. Also, the author barely covers or mentions little about Russian geography, Russian military history, or the process of Russian territorial expansion. While he did an amazing job covering the other aspects of history, I felt a loss with the absence of these elements, hence my 4 star review. Some portions, especially discussions of intellectual movements, may seem a little heady for one looking for a light listen. 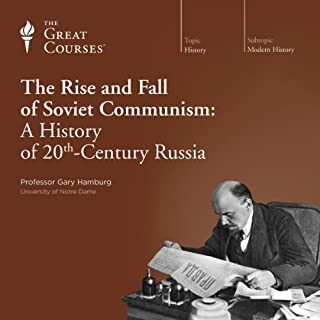 I have been searching for a decent documentation of the history of modern Russia for quiet a while, and this audiobook delivers. It explores the philosophies, inner movements and conflicts that Russia had gone through. 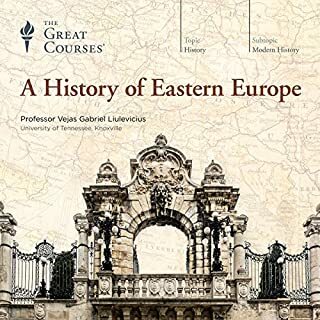 If you're interested in exploring the history of Russia in an unbiased, academic way, look no further. 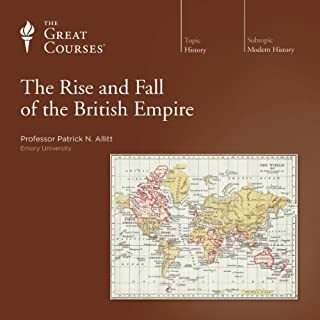 The professor does a great job of tracking the major grievances in Russian society for the centuries leading up to the revolutionary era, so that by the time you hit those courses it all kind of makes sense. The professor is very conversational and easy-to-follow. He gives off the immediate sense that he's an "insider" to Russian history, and this adds a great deal of listenability. 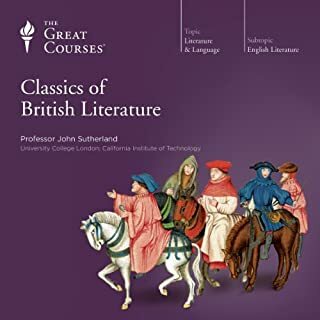 There are times where I found the narration a bit jumbled (some anecdotes seeming too long or not fitting with the overall narrative), but more often than not I was totally engrossed. 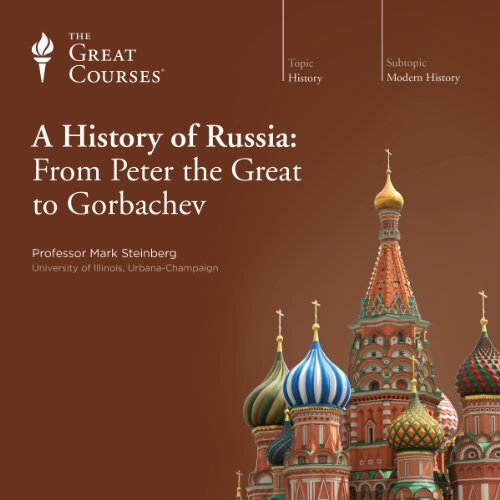 What disappointed you about A History of Russia: From Peter the Great to Gorbachev? I assumed this would be a lecture series about Russian History, but what it really was was a history of Russian politics and philosophy. While parts were interesting, I am not personally interested in the philosophy of the Russian people, I am more interested in the events that shaped the country. 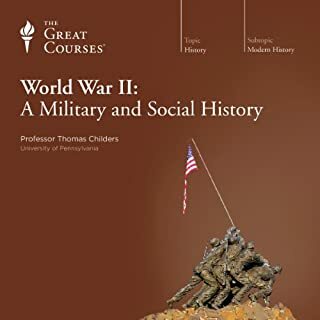 For example, the professor barely mentions the Napoleonic Wars or any other war for that matter. I would have preferred he cover the majority of the information he covered, but also cover wars and other things besides politics and philosophy. 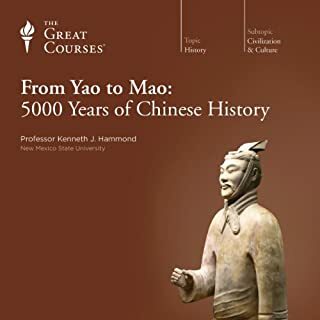 Yes, I listened to the Ancient Egypt series and I have started one on the Chinese, but this particular course was not nearly as good. Professor Steinberg is good, speaks well. This doesn't go too deep with the early czars, but I've enjoyed it. If you could sum up A History of Russia: From Peter the Great to Gorbachev in three words, what would they be? An excellent study of the personalities that shaped Russia as we know it today, though it tantalizingly stops short of the modern events that have led to Putin's new expansionist Russia. It will be very interesting to see where it stops short. I would like to have a bit more of a structured recounting of the major events, but in the introduction the approach is presented to be a treatment of the major persons more than the events. Character, hmm, well Peter the Great was certainly a character but my real fascination is with Lenin. The October Revolution - just astonishing to think how this *might* have turned out differently. The utter disregard for life shown by Stalin, and the commitment to an misguided ideal that can cause a nation of people to fall to evil. I hesitate to mention this, as it's one of those things you might not notice until I point it out, but the presenter has a case of the "uhms" that kept distracting me from the otherwise very good performance. Otherwise I'd nudge the stars up a little. 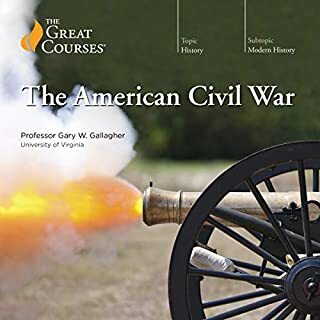 The fact that the lectures spend a lot of time (whole lectures) discussing this or other Russian thinker, sometimes an obscure one, and yet the Napoleonic wars are mentioned only in passing and only as a backdrop to Tolstoy's War and Peace. Whole centuries are glossed over only to spend entire lectures on the intricate arguments of one or other faction in the Russian Intelligentsia (for instance, the lectures jump from late 18 century to mid 19th century in a few sentences). Also, HUGE events are basically ignored or treated from intellectual point of view only. For instance, the lecturer discusses in details the ideas that spread as result of the rapid Urbanization. The reasons and policies that led to that urbanization are not discussed at all. Other (i.e. non-intellectual) consequences of the urbanization are not discussed at all. The holodomor (3 million Ukrainian peasants deliberately starved to death) and the second world war also receive the same treatment. It could contain more actual history. Events, wars, economic development, policy. You know, the kind of things one would expect to find in a series of lectures about History. Probably. But I'm too disappointed to think of any. 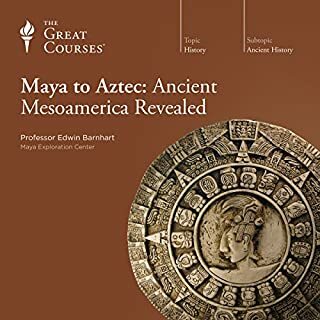 When I started this course, I had already listened to, and finished, 6 Great Courses. So I had something to compare to. I have to say that I found this one slightly frustrating because the author emphasizes too much in philosophical, cultural and small details of the day lives of Russians. Please don't get me wrong, I found very interesting to learn those things, but I think the Professor spends too much time on them with almost emotional opinions related to some events. Those comments gave me the impression that the course may be not as object and impersonal as the other courses I took. Besides I have to agree with other reviewers when they said they have missed more information about major events. Ok, it is impossible to cover more than 200 years of a huge nation like Russia, but I have also missed some details as well, especially in the twenty century. The strongest positive aspect (very well explained, by the way) is the clash between the Slavs culture (mixed with others) versus the European culture and values. This is actually an ongoing ‘battle’. It has started during the Tsar era (Peter the Great has played the great big push towards Europe, and in this sense, he can also be considered the one who has started this quarrel). A recent book, “The New Tsar: The Rise and Reign of Vladimir Putin” (also available in the Audible system), shows how the clash is still alive today. By not understanding the reasons for this clash, it is not possible to fully acknowledge why Russia is so unique and has attracted so many suspicions from European countries through history. 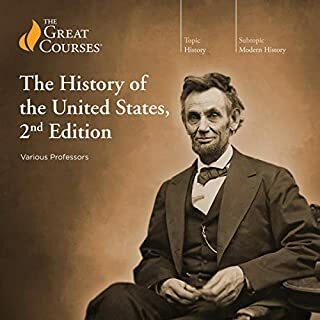 Finally, I would recommend the course only calling the attention that it may frustrate some of the listeners who are expecting more emphasis in big historic events in comparison to the historical developments and evolution of this great nation and people. 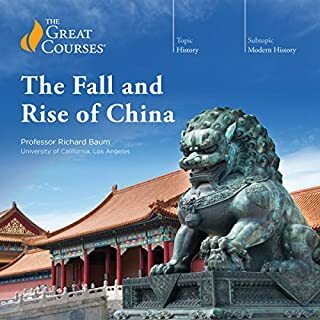 Loved the Lecturer's passion for his subject and the balance with which he approached hot button topics such as Socialism, Fascism, Communism and their various forms. Gave me a better understanding of Russia today and appreciation for its people and their struggle for freedom as they define it.